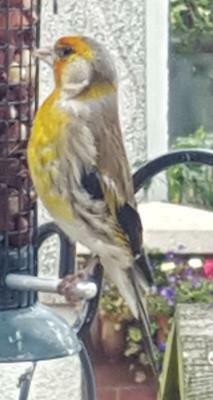 Similar size to a goldfinch. 1st picture take on phone, 2nd on half-decent camera. Was there feeding for 10 minutes, unlike goldfinches. Orange and yellow. Circular area below eye seemed to fluff up 3D. Was quite brazen, taken from 4 feet away, through a window. Loved the peanuts, ignored the seed. 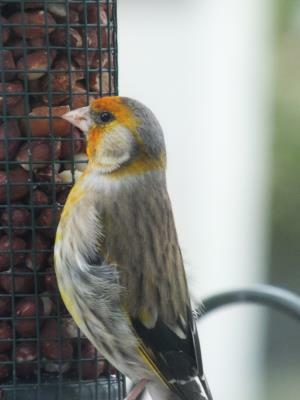 3 My guess would be that it is a young Goldfinch.